If you’ve been feeling emotionally taxed (pun intended – yes, this is the season) and/or mentally foggy, I have a suggestion for you. Increase your intake of fermented foods containing those good bacteria, probiotics. Recently I interviewed Dr. Emeran Mayer for my upcoming television special, Natural Breakthroughs with Brenda Watson. Dr. Mayer is professor of medicine at UCLA, a specialist in gastroenterology and is the director of the UCLA Centre for the Neurobiology of Stress. 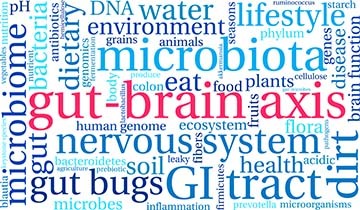 He has written several books that explore the brain-gut connection and in fact has a new book coming out in July that combines cutting-edge neuroscience with the latest discoveries on the human microbiome. I wanted to share the results of a study that Dr. Mayer and his team conducted with 36 healthy women that may take the edge off your day. He divided the women into 3 groups that committed to drinking a specific beverage twice a day for four weeks. One group drank milk fermented with probiotics, the second drank milk without probiotics, and the third drank a non-milk product. The women agreed to undergo functional magnetic resonance imaging of their brains before and after the four-week period. The test results of the group drinking the fermented milk positively affected the activity of brain regions that control the central processing of emotion, sensation and even task completion, compared to the other two groups. That’s certainly a direct gut-brain connection. And a calming and productive one at that! Eating fermented foods on a daily basis is a core concept in the Skinny Gut Diet. Fermentation educator Donna Schwenk joined us during the filming of that public television special, and shared many simple recipes. Milk can easily be fermented to create kefir, a food that naturally offers a rich diversity of probiotic species. Kefir can be enjoyed as a beverage, or included as an ingredient of a wide array of other delicious treats, from ice cream to salad dressing to smoothies. Fermented vegetables are my personal favorite. Although cabbage is certainly a versatile crowd favorite, I really enjoy culturing different veggies like asparagus, broccoli and carrots. Through the ages, fermenting has been used around the globe to extend the life of foods, and without direct awareness at the time, people’s lives were improved too. There are even some great tools that make fermenting easier than you can imagine, and great fun too! Although some people in our germ-phobic society may be worried about the safety of fermenting, when we ferment produce whether we use salt or a starter culture, the probiotic lactobacilli predominate, crowding out potential bad guys in the process. It’s interesting to note that improperly washed raw veggies out of our gardens or from the store can actually contain harmful microbes and can potentially create more issues than their fermented counterparts. Adding more probiotics in any form into your daily routine is a sure winner – for a healthier gut and a sharper brain!